Giveaway ends December 15, 2014. Giveaway ends December 15, 2014. See the giveaway details at Goodreads. To celebrate the release of Connor: The Wilde Brothers (3rd book in the series: The Billionaire’s Desire), Alec is on sale for 99c! Last till 9/16. 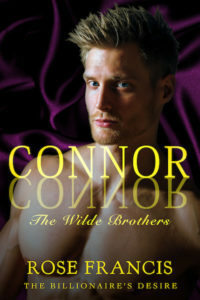 Synopsis: Connor Wilde has been on quite a ride. Only twenty-four, a lifetime of craziness has happened to him, and it doesn’t seem to be slowing down. He feels destined to live life in the extreme, so he expects nothing more than drama when the latest annual game he plays with his brothers requires that he revisits part of his crazy past. He feels compelled to face Gabriela Miller again—a girl whose heart he crushed back in high school, and who would probably slap him silly if she ever saw him again. But Connor feels a pull to her he can’t deny. Besides, what he did to her—that was so long ago; she couldn’t possibly still be holding a grudge, right? Connor realizes he is usually a force of destruction, but he straps himself in for the ride, hoping that, instead of inflicting more damage, he can repair some part of their connection instead. To Gabriela Miller, Connor Wilde is like fire itself: entrancing and dangerous. She has been burned by Connor before, and how many times does one need to stick one’s hand in a fire to realize the damage it can cause? When Connor pops up in her life again, she knows he is up to no good; at the very least, smoke is on the horizon, whether he means to start a fire or not. But the thing about fire is that sometimes, it has to take its course, no matter how much water you try to douse it with. Gabriela plans to fight Connor off for as long as she can, but if he finds his way in again, will she be left in ruins, like before? Released 7/2/14 is the second tale from the Wilde brothers in the series: The Billionaire’s Desire. SYNOPSIS: Just a few bored billionaire brothers having fun. But at whose expense? Brandon doesn’t have a care in the world. Luck has followed him and his twin brother, Connor, their whole lives—even landing them in the billionaire’s club—and the luck of genetics ensured him that, with or without money, he would always have women after him. But Brandon’s luck has just run out. He has agreed to the terms of an annual challenge with his brothers to conquer a woman from a chosen group, and in the process, suddenly finds himself facing a conundrum: while carrying out the dare with one woman, he realizes his feelings for a childhood friend, Erica, goes far beyond friendship—especially now that she’s getting married. Now, two gorgeous prizes are on the line, and it seems he can’t win one without losing the other. If he drops everything and goes after Erica, he loses the game. If he lets his fake relationship play out, he wins his older brother’s stunning Hawaiian beach house, but could lose Erica forever. Brandon is used to surfing along wherever life wants to take him, but will he finally interrupt the flow and take a necessary risk? Sydney Johnson is a nerd and proud—always doing the right thing, and following the rules. But routine fails her one evening, as she finds herself the random target of a kidnapping and assault by a group of boys. As a result of being blindfolded, she never sees her attackers or the location of the crime, so she decides to keep the incident to herself. She later drowns herself in college academic tasks, her only companion her childhood best friend—until she meets Nicholas Dhalton. Devil-may-care Nicholas doesn’t know much about consequences. A rich heir, he finds little reason to acquaint himself with responsibility. But everything changes when Sydney Johnson enters his life. Once their paths cross, and against their better judgments, Nicholas and Sydney embark upon a relationship at the risk of all that is familiar and stable. As their relationship grows, and they reveal their deepest secrets, they eventually realize they have a damning past. 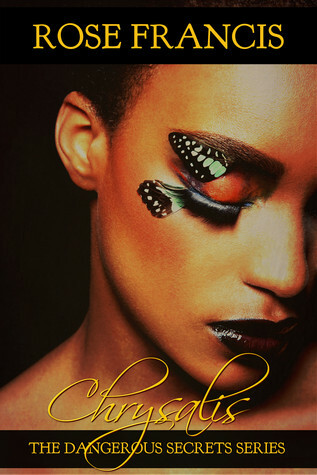 With race and class trying to separate them, can their love survive yet another obstacle? Giveaway ends June 02, 2014. Lisa Kelly is making her way through college, hanging on to a codependent relationship she no longer really wants to be in for the sake of its familiarity. 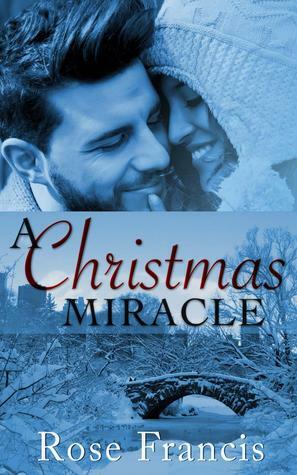 Daniel is a fellow student, a stranger, and nothing more than a blip on her radar until one day, she discovers something about him that makes him more than a blip, and she starts wondering what it would be like to be with him. She is terrified to even think about leaving her possessive boyfriend and losing all that comes with him: the easy companionship, all their mutual friends, and her carefully constructed social life. But thoughts of Daniel begin consuming her so much, she writes a passionate poem about it to purge, hoping that putting her feelings and confusion out into the universe will help bring clarity. The morning after she writes her poem, however, she realizes something odd: she starts hearing things as if by telepathy—a voice seeming to come from Daniel, telling her how much he wants her, letting her know it’s safe to leave her boyfriend and try her luck with him. She wonders if Daniel is there just to remind her that there is life beyond her dead relationship, that possibilities abound in the real world. But what about the voice she has started hearing? Is her mind playing tricks on her? Has wanting Daniel made her fool myself into thinking what she wishes he would say is what he is actually thinking? Or is Daniel really the one, and the universe has found an odd way to get the message to her? 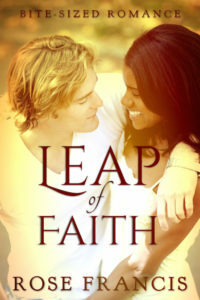 A BWWM Interracial Romance, “Leap of Faith” is a novelette of about 14,000 words. It is a light tale of budding romance with a dash of telepathy, and the second in the sci-fi Bite-Sized Romance series. Released 1/8/14, and currently available on Amazon and other channels! Emancipating Alice: Second Edition is here!